"Portrait of Billie Holiday at the Downbeat club, New York, ca. February 1947." Medium format negative by William Gottlieb. View full size. I especially tried to capture personality, but that's an elusive quality, and I was successful only a portion of the time. 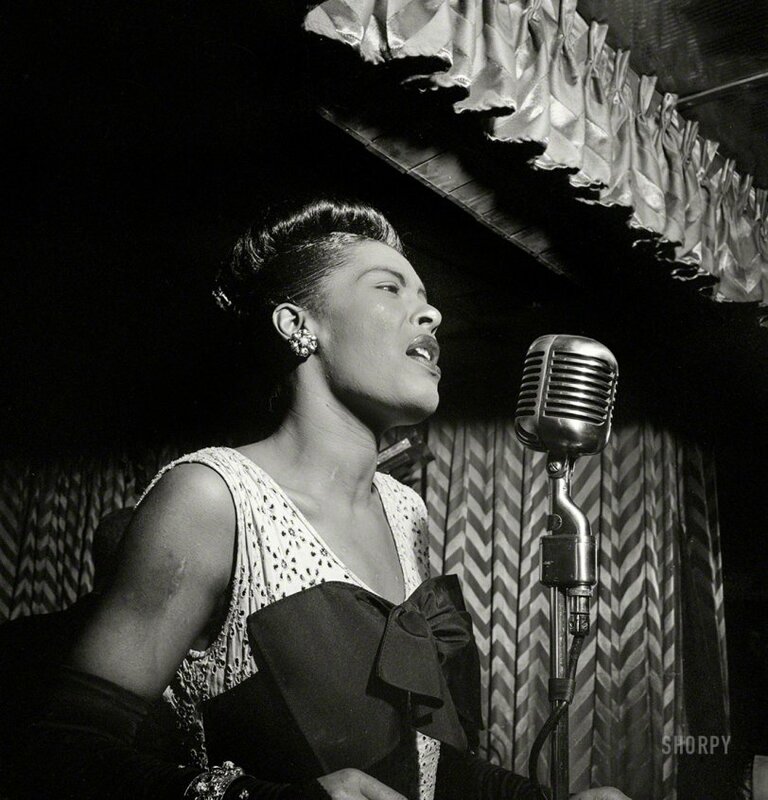 But I certainly hit it on the button here with a picture of Billie Holiday, whose voice was filled with anguish. I also tried to catch the beauty of her face -- she was at her most beautiful at that particular time, which was not too long after she had come out of prison on a drug charge. She couldn't get at any drugs while she was incarcerated, or alcohol, and she lost weight and she came out looking gorgeous, and her voice was, I think, at its peak. And I was fortunate enough to have spent some time with her during that period, and I caught this close-up of her in a way that you could really see the anguish that must have been coming out of her throat. Submitted by kentinal on Sat, 02/09/2019 - 7:32pm. If I could only listen to one musician/group for the remainder of my life, it would be Billie Holiday. Submitted by Bike Bubba on Thu, 02/07/2019 - 1:19pm. what patrons at the Downbeat Club thought when they saw that bruise (?) on her arm. Love the old jazz singers and instrumentalists, but I have to wonder whether too much of that beautiful music was caused, so to speak, by bruises like that. Submitted by archfan on Fri, 02/08/2019 - 1:04am. I naively thought that William Gottlieb only took sedate pictures of boutiques and modernist houses. This recent series of jazz singers and 52nd Street scenes shows a whole other side of him. He had his finger on the pulse of the city! Gee, you're right, sorry! Although there was a rumor Sam liked an occasional sarsaparilla.